SASKATOON, SASKATCHEWAN--(Marketwire - Sept. 11, 2012) - ole, one of the world's largest independent music publishers has been honoured by the Canadian Country Music Association (CCMA) as Music Publisher of the Year for the 6th consecutive time in the company's eight-year history in a year when ole writer/artist Gord Bamford was named Songwriter of the Year. It's the longest successful run by an independent publisher in the history of that category at the CCMA Awards. This year ole writers/artists dominated the winner's circle as part of 17 ole direct and affiliated awards. They were also responsible for more than a quarter of the songs heard in live performance during the CBC-televised CCMA Awards Gala. Dean Brody (Roots Three/ole), who opened the show with a performance of his #1 single "Canadian Girls," one of five ole-related songs heard that night, was named Male Artist of the Year and took the honours for Album of the Year, the prestigious final award of the night, for Dirt, which also received recognition for Album Design. Johnny Reid, who recently accounted for 10 percent of the titles on the SoundScan Country Top 50 album sales chart, took home the Top Selling Album award for Fire It Up along with the coveted Fans' Choice award. He performed his current single "Dedicated To You (The Remix)" at the Awards. Gord Bamford picked up his Songwriter award for co-writing "Is It Friday Yet?" Producer of the Year, for his co-production work on his album Is It Friday Yet? and Interactive Artist of the Year. Video director Stephano Barberis was honoured for his work on Bamford's video "Is It Friday Yet?" Bamford closed the Awards gala with a performance of the title track of his current album, Is It Friday Yet? "ole is pleased to receive this honour from our peers in the CCMA for the 6th year in a row," states CEO Robert Ott. "We remain passionate about great songs, songwriters and Country music on both sides of the border." Other ole-related awards included Top Selling International Album of the Year, won by Lady Antebellum's Own the Night, which has two cuts co-written by ole's Monty Powell, and Roots Artist of the Year, which honoured Jimmy Rankin whose current album, Forget About the World, contains ole songs, including the title track co-written by ole writer, Tebey. ole writer/artists Johnny Reid, Dean Brody (Roots Three/ole), Gord Bamford and George Canyon were featured performers on the CBC-televised show, as was Eric Church, who recently topped the U.S. Billboard chart for two weeks with the platinum single "Springsteen," which he co-wrote with ole writer, Ryan Tyndell. ole is one of the world's largest independent music publishers. Founded in 2004, and with offices in Toronto, Nashville and Los Angeles, ole boasts a team of 40 experienced industry professionals focused on acquisitions, creative development and worldwide copyright administration. ole has recently entered the Production Music space with operations in the U.S. (MusicBox) and Canada (clear). ole has been named Canadian Country Music Association's Music Publishing Company of the Year for the past five years and earned its first Grammy Award in 2009 for Best Country Song, "White Horse." Other recent notable ole awards include: Academy of Country Music (ACM) 2012 Song of the Year Award for "Crazy Girl" (Liz Rose/Lee Brice); SESAC 2011 Country Performance Activity Award for "Til Summer Comes Around" (Monty Powell/Keith Urban); three BMI 2011 Most Performed Songs Awards for "Fearless" (Liz Rose, Taylor Swift); "Why Wait" (Jimmy Yeary, Tom Shapiro) and "Let Me Down Easy" (Marty Dodson, Jennifer Hanson, Mark Nesler); 2011 SOCAN Country Music Award for "Make Hay While The Sun Shines" (Steven Lee Olsen, Bruce Wallace); 2011 SOCAN Domestic Television Series Music Award "Busytown Mysteries" (Peter Coulman, Carl Lenox, David Tedesco); and 2011 SOCAN Award for 100,000 Radio Performances of Lighthouse's "Sunny Days" and "Pretty Lady" (Skip Prokop). The ole catalog includes over 45,000 songs and 40,000 hours of TV music across all genres. ole has completed over $120MM USD in acquisitions, including purchases of music catalogs: Blacktop, Jody Williams Music, Rami Yacoub, Chris Wallin, Rick Giles, Balmur, Keith Follese, Lighthouse, Frank Myers, Dream Warriors, Encore, David Tyson, and Marsfilm Music. ole has also purchased the worldwide music rights for TV catalogs such as WGBH, Cookie Jar, Cineflix, CCI and recently, "The Cat In The Hat Knows A Lot About That." ole is committed to the creative development of its 6o+ staff songwriters, legacy writers and composers and the cultivation of our catalogs and client catalogs. ole has ongoing co-ventures with Last Gang Publishing (Alt Rock), Roots Three Music (Country) and tanjola (Pop/Rock/Urban). ole is an expert in administrating and sub-publishing music copyrights and has concluded worldwide publishing administration agreements with some of the world's leading songwriters, publishers and film and television producers. adminow, ole's online client account transparency portal, was launched recently and demonstrates ole's commitment to modernizing its client services and to leading-edge IT. Notable copyrights for ole include Taylor Swift singles "Fearless," "White Horse," "Tim McGraw," "Picture To Burn," "Teardrops On My Guitar"; Rascal Flatts' "Why Wait"; Kelly Clarkson's "Miss Independent"; and "I'm Not a Girl, Not Yet a Woman" by Britney Spears; Pink's "You and Your Hand"; "It's Gonna Be Me" from 'N Sync'; "Shape of My Heart" by Backstreet Boys; iconic Canadian Olympic theme "I Believe"; "Legendary Child" by Aerosmith; "Black Velvet" by Alannah Myles; Tim McGraw's "Something Like That." ole owns or represents up to 150,000 production music tracks within its MusicBox and clear libraries. With 9 staff in North America, ole's Production Music division delivers excellent customer service and quality Creative on a leading edge IT platform. Our production music division leverages ole's established Administration, Finance and IT services. ole is committed to being the best and most innovative global destination for world-class songwriters, composers, and management talent, and the first choice music source for creators in all media. To view the photo associated with this press release, please visit the following link: http://www.marketwire.com/library/20120911-ole800.jpg. 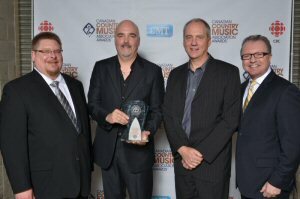 Pictured backstage at the CCMA Awards in Saskatoon celebrating ole's 6th consecutive win as Music Publisher of the Year are ole's Mike Sebastian, Senior Director, Catalog; Robert Ott, Chairman & CEO; Michael McCarty, President and Gilles Godard, Chief Creative Officer. Photo: Grant W. Martin Photography.